When you think of daily deal shopping, what’s the first thing that comes to mind? If you’re like most, your thoughts immediately jump to how much you can save on a flight, hotel stay, or evening out at your favorite restaurant. That is, after all, how we use daily deals, right? Daily deals aren’t only improving the lives of consumers, however, but also those who make daily deals available. 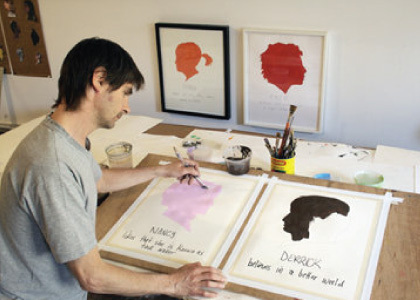 Silhouette artist Carter Kustera has had his work featured in galleries and museums around the world. The 49 year old Kustera creates work in a wide range of mediums and had his art recently animated and used for U2's Pop Mart Tour. Kustera is not only a talented artist, but also a smart businessman. Kustera spent much of the last year painting 5,000 captioned, expression-filled watercolor portraits that customers were able to buy only through daily deal websites. How's business? Kustera says he's seen an impressive 12,400 percent increase in his yearly earnings, all thanks to daily deal website sales. “Once people started contacting me, many told me they had been following my work for nine or 10 years, but could never afford it,” said Kustera. Kustera first offered an initial sell of 3,000 silhouettes on Groupon. In January of this year, Kustera switched over to Cing.com, a relatively new startup that sponsors deals nationally, but takes no cut. Kustera, who usually charges $400-$3,000 per silhouette, depending on size, sold his work for less than half price on Groupon, and offered small silhouettes on Cing for just $20.